Deal – Get Amazon India Diwali Special Great Indian Festival sale offer 2nd-5th Nov 2018 with HDFC EMI, Credit & Debit cards. Get 10% Instant discount on HDFC Bank Debit, Credit Card and EMI. Minimum purchase Rs. 2000 required. The maximum cashback permitted/allowed per Card (including all add-on-cards) during the Offer Period is Rs. 1,500/-. The offer is valid from 2-Nov-2018 to 5-Nov-2018. you would get Instant Discount but only on the amount charged on your HDFC Debit or Credit Card. Also, to avail instant discount, your HDFC card should be charged for a minimum amount of INR 2,000. For example, if total purchase amount is INR 8000, and INR 1,000 is paid using Amazon Pay Balance and INR 7,000 is paid using HDFC card, then instant discount would be given on INR 7,000 and not INR 8,000. Similarly, if INR 7,000 is paid using APay balance and INR 1,000 is paid using HDFC card, then customer would not get any discount because the amount paid using HDFC card is less than INR 2,000. 1) What’s the “Free Movie, Meal and Recharge” Offer? (b) The final order value, net of all other applied discounts should be equivalent to INR 500 or more in order to be eligible for the offer. (d) The offer can only be availed once per customer per merchant during the offer period. An offer cannot be split and used across multiple orders. 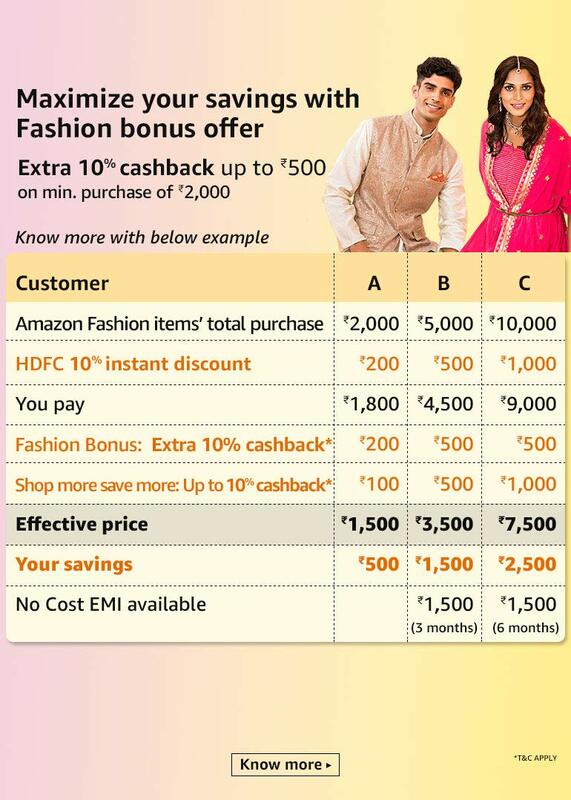 2) How can I avail this cashback offer? (c) Post order confirmation, you will receive an email/SMS/app notification from Amazon within 3 days with a link to collect the 3 unlocked offers. (d) Collect the unlocked offers using the link. (e) To avail the Swiggy/Bookmyshow offer, place an order on their website/app and make the payment using Amazon Pay. (f) To avail the Amazon.in Recharge offer, do a mobile recharge on Amazon.in using any payment method. (g) You can avail these offers on or before 11th November 2018 and receive cashback within 5 business days of placing the order for cashback offer on the merchant’s site or app and completion of payment. 3) Do I need any coupon code to avail the offer? No, you need not apply any coupon code to avail the offer as long as you pay using the same Amazon account you received the offers on. You are requested to ensure that you have collected the offer using the link sent by Amazon. 4) How and when will I receive the cashback? Get similar deal, when you click following Tags: Books, Electronics, Footwear, Headphone & Speakers, Health Care, Home Appliance, Mobile & Smartphone, Pen Drive & Memory card, Personal care device, Tablet, Television / TV, Watch .